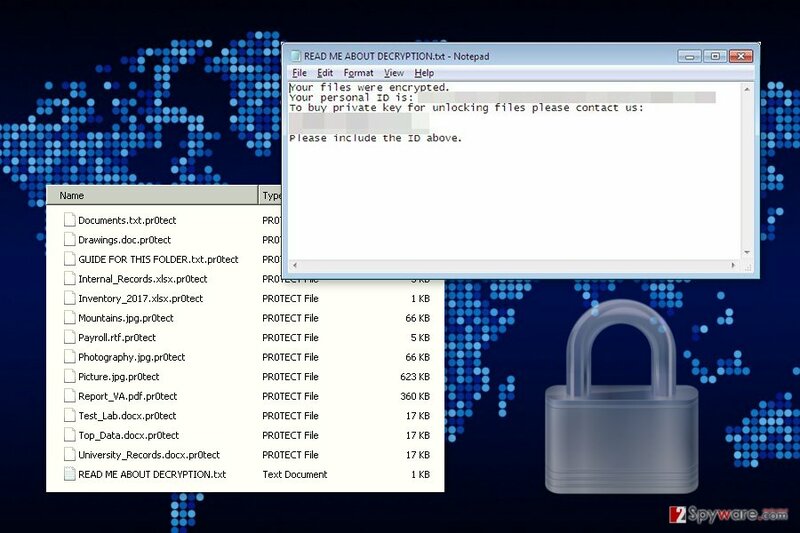 Sorebrect ransomware uses sophisticated techniques to infiltrate computers and hide from its victims. Use Reimage to determine whether your system is infected and prevent the loss of your files. Sorebrect is a recently discovered fileless malware that aims at various businesses. During data encryption, it appends .pr0tect file extension and drops a ransom note called “READ ME ABOUT DECRYPTION.txt” where cyber criminals ask to contact them. Malware has been spotted attacking technology, manufacturing, and telecommunication enterprises in Kuwait, Lebanon, Croatia, Italy, Russia, China, Japan, U.S, Canada, Taiwan, and Mexico. However, it is expected to continue spreading in other countries. The virus launches attacks at servers and endpoint. Once it affects one device, it continues spreading through all the devices that are connected to the same network. Cyber criminals might use PsExec utility and Remote Desktop Protocol (RDP) to operate on the affected device. However, the first method is simpler and more effective because it helps to execute commands from the remote server. Sorebrect virus communicates with its Command and Control (C&C) server using Tor network that assures anonymity. One of the main significant features of the ransomware is the encryption strategy. Sorebrect uses a brute forcing attacks to compromise administrator’s credentials. Then it exploits a Microsoft’s Sysinternals PsExec command-line and starts data encryption procedure. 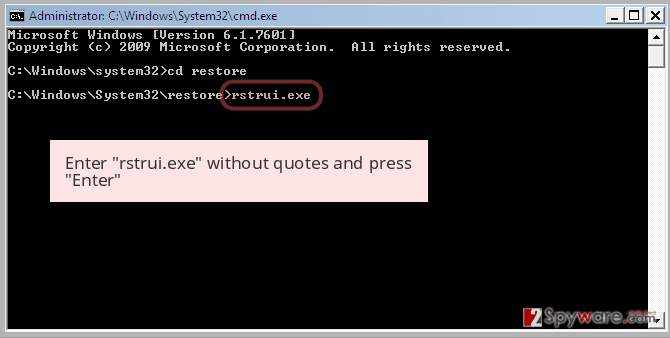 Once it injects malicious code to svchost.exe – a legitimate Windows process – it deletes the binary. This feature makes ransomware fileless and hard to detect. Usually, ransomware viruses are designed to install malware executable directly to the hard drive. However, such cyber threats are quite easy to identify. Meanwhile, to find and delete fileless ransomware, users have to employ a professional security software. We recommend performing Sorebrect removal with the help of Reimage. Sorebrect ransomware aims at various companies and affects all devices that are connected to the same network. During data encryption, the ransomware appends .pr0tect file extension to each of the targeted documents, audio, video, image and other files, and continues its malicious activity in all devices connected to the same network. After the attack, all encrypted files become useless. If enterprises do not have backups, they are in serious problem. Sorebrect ransomware is designed to delete system event logs by exploiting wevtutil.exe and Shadow Volume Copies by using vssadmin. Thus, data recovery with third-party software is nearly impossible. Following data encryption, ransomware also delivers a ransom note. In the short message, criminals tell victims to contact them via provided email addresses (pr0tector@india.com and pr0tector@tutanota.com ) and send their unique ID number. It’s unknown how much Bitcoins ransomware asks to pay for data recovery. It may differ based on the size and amount of encrypted files. However, paying the ransom is not recommended. If you have backups, you have to remove Sorebrect from the PC immediately, and then connect the external storage device. Backup files. Keeping copies of the data and frequently updating it helps to recover from the ransomware attack quite easily and without paying the ransom. Update system and networks. Keeping software, system and software updates helps to prevent malware from using security flaws to launch the attack. Limit accessibility to PsExec. 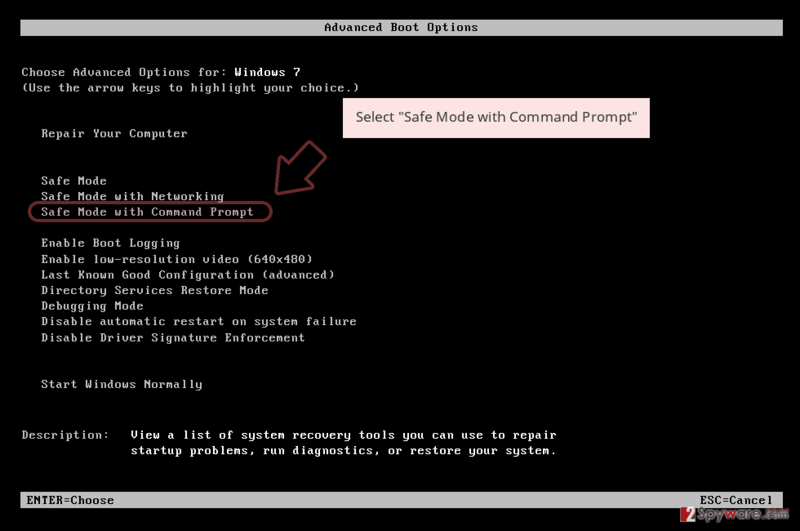 Sorebrect exploits this feature that is widely used in enterprise networks. Thus, it’s important to limit it. Restrict user write permissions. Limiting user’s permissions, strengthening and adjusting security of the shared folders on the networks are important measures to avoid this malware. The only safe way to remove Sorebrect form the device is to scan the computer with reputable malware removal program, such as Reimage, Malwarebytes MalwarebytesCombo Cleaner or Plumbytes Anti-MalwareMalwarebytes Malwarebytes. Manual elimination is impossible because it’s a fileless malware. Thus, you cannot find its binary and delete it together with its components. What is more, manual removal is never recommended due to the difficulty of such cyber threats. Sometimes ransomware prevents users from accessing security software. 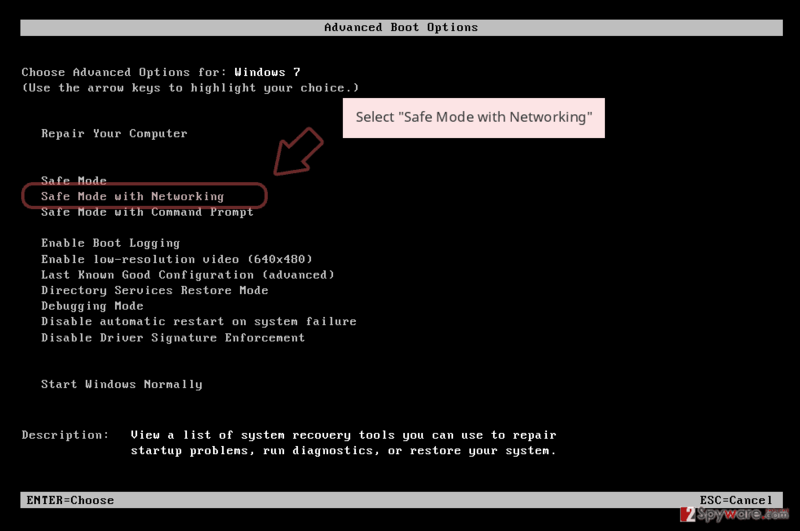 If you cannot install your preferred removal program, you have to reboot the computer to Safe Mode with Networking. If you are dealing with some problems with Sorebrect removal, please follow the instructions below. 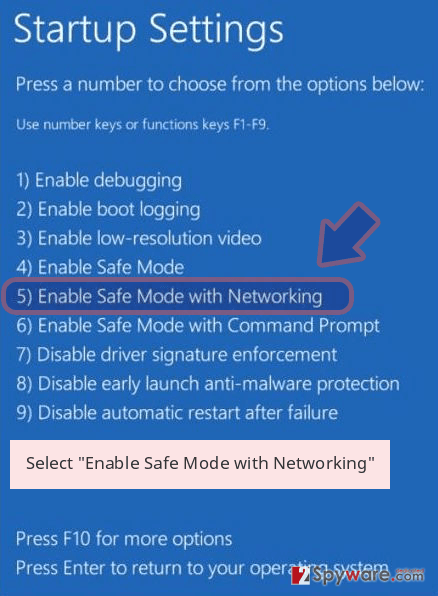 If you cannot install malware removal program to run delete the virus, you have to reboot the computer to the Safe Mode with Networking as shown below. Log in to your infected account and start the browser. Download Reimage or other legitimate anti-spyware program. Update it before a full system scan and remove malicious files that belong to your ransomware and complete Sorebrect removal. 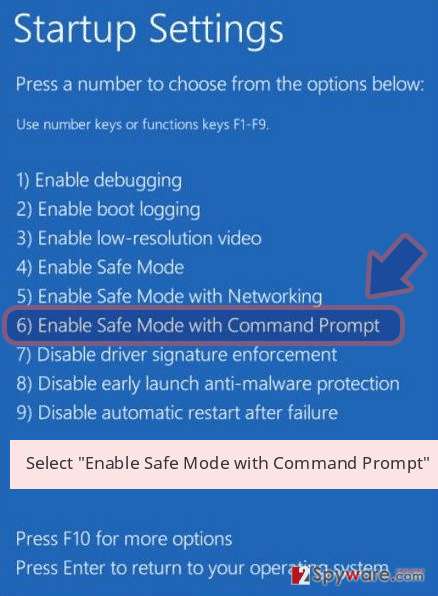 Follow the steps below to disable the virus and run automatic Sorebrect removal. 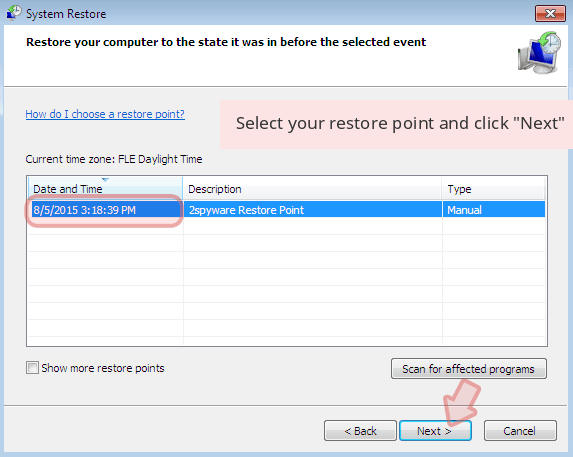 When a new window shows up, click Next and select your restore point that is prior the infiltration of Sorebrect. After doing that, click Next. 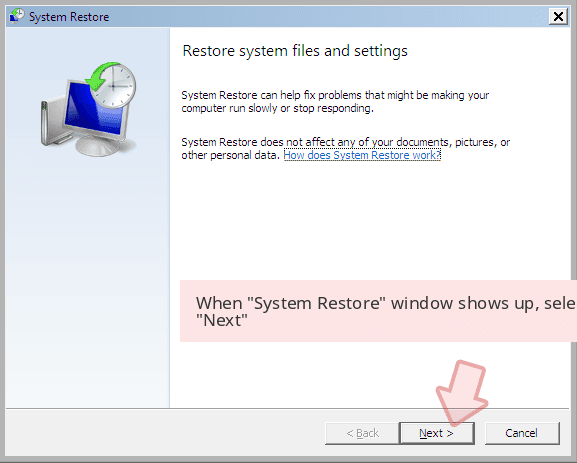 Once you restore your system to a previous date, download and scan your computer with Reimage and make sure that Sorebrect removal is performed successfully. Guide which is presented above is supposed to help you remove Sorebrect from your computer. To recover your encrypted files, we recommend using a detailed guide prepared by 2-spyware.com security experts. In order to recover files after ransomware attack, you need backups. However, if you do not have them, your chances to recover data are low. But you should try our suggested recovery options. Hopefully, they will help to restore at least some of your files. This tool has been created to restore corrupted, accidentally deleted and some of the encrypted files. Sorebrect decryptor is not available yet. ^ Margaret Rouse. Fileless infection (fileless malware). TechTarget. Latest technology news and global network of technology websites. ^ Swati Khandelwal. New Fileless Ransomware with Code Injection Ability Detected in the Wild. The Hacker News. Cyber Security, Hacking News. This entry was posted on 2017-06-19 at 03:33 and is filed under Ransomware, Viruses. You can quickly scan the QR code with your mobile device and have Sorebrect ransomware virus manual removal instructions right in your pocket. How did you remove Sorebrect virus?